In the past few weeks, I’ve been testing the new Orange Blossom range from Green People. I was really happy when Green People contacted me offering me to test one of their new ranges. I already read some good reviews about them and couldn’t wait to test their Orange Blossom collection. Read on to find out what I really thought about it. 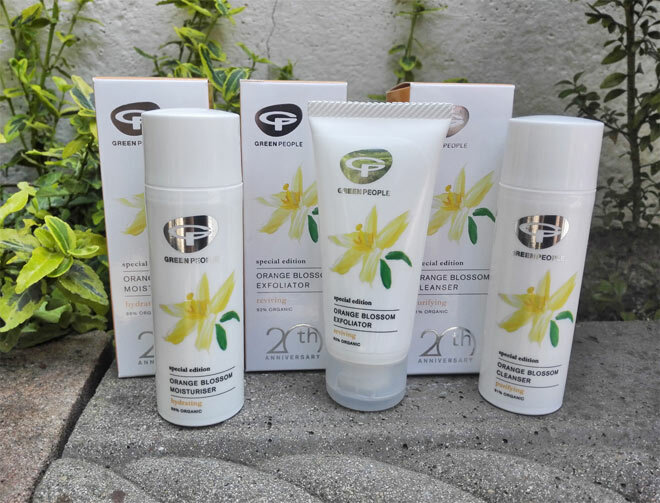 Green People are well regarded organic skincare brand and this year they are celebrating 20 years of their existence. Over the years they have won several awards from different organisations, magazines and beauty experts so you probably can’t go wrong when buying their products. Their products are certified organic and natural by either the Soil Association, EcoCert or Organic Food Federation (some of their products hold more than one certification). They have also been certified as a cruelty-free brand by PETA. Their wide range of products caters for the whole family which not many brands can boast about. So in their shop you will find natural products suitable for babies and children as well as products for men and teenagers. Their scent-free range is suitable for sensitive skin and their Age Defy+ collection has been created especially for women aged 35+. Green People products contain no parabens, SLS/SLES, lanolin, phthalates, propylene glycol, harsh foaming agents, irritating emulsifiers, synthetic fragrances, gluten, etc. Over the years I have tested several of their products, for example, their sunscreens and their facial sun cream but also their anti-ageing facial oil and mascara. 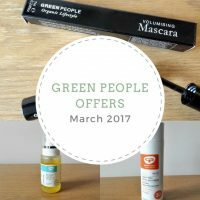 I was happy with most of the products that I’ve tried and for this reason Green People are a brand which I tend to recommend to people a lot. Get 15% off Green People’s products, use the code HEALTHY15, FREE UK delivery. To create Orange Blossom (and Damask Rose) range, Green People have collaborated with one of the UK’s leading aromatherapists and essential oil experts. The final products have a depth and complexity in aroma that is rarely found in natural cosmetics today. The aroma of all three products is just wonderful. It is described as ‘fresh, uplifting aroma with sophistication, depth and complexity’. This is created with the exotic aroma of orange blossom and added top notes of Grapefruit and Bergamot, middle notes of Lavender and Rose Geranium, and base notes of Black Pepper and Cypress. This combination of scents is not only beautiful but it also has therapeutic benefits which leave you feeling good. Neroli oil is known to reduce stress, help you relax and relieve insomnia. To me, all the products smell lovely but not very citrusy, in all honesty. It’s more floral than citrusy aroma. Over the years I’ve tried several different natural moisturisers and this Orange Blossom moisturiser from Green People definitely stands out. It’s not only about the wonderful scent but also about how my skin feels afterwards. The ingredients in this moisturiser all work together to nourish, rebalance and prevent breakouts. Prebiotics in this moisturiser are great for fighting blemish-causing bacteria and Black Willow bark helps to clear pores. In addition, we also have green tea extract which is rich in antioxidants and helps to fight free-radical damage. This moisturiser is really hydrating and my skin feels so soft after use. You only need to apply a little bit to feel the benefit (this means a small 50-ml bottle should last you a long time). I think this moisturiser will perform great in winter when the skin needs a little bit more moisture. It is good for summer as well as it’s non-greasy and quick to absorb so you can easily use it under your makeup as well. You can use it day and night. I actually asked my fiance what he thinks about this moisturiser. I put it under his nose and asked him whether he thinks it was for men or women. His answer was ‘both’ which made me extremely pleased and just confirmed my thoughts on scent – it wasn’t that feminine. Orange Blossom moisturiser is 96% certified organic, vegan, cruelty-free and fairly traded. All in all, I really love this moisturiser and I cannot find any faults with it. It now joins my favourite natural moisturisers and I will definitely be recommending it to others. 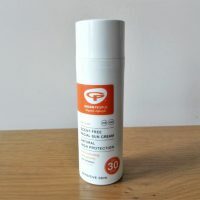 To get 15% off this Green People’s moisturiser, use the code HEALTHY15, FREE UK delivery. 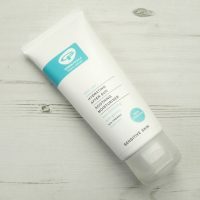 Green People Orange Blossom Exfoliator is another product from their range which hasn’t disappointed me. If I compare it to the natural exfoliators that I’ve tried so far, Green People Orange Blossom exfoliator is incredibly gentle. It’s made with ultra-fine exfoliating particles of Bamboo and Apricot kernel which don’t feel scratchy on the skin. I actually haven’t used an exfoliator before, made with exfoliating particles which are so fine. This has definitely impressed me. The exfoliator does a brilliant job. It effectively removes dead skin cells and reveals a smoother complexion underneath. It contains shea butter which nourishes the skin so at the end you don’t feel like it’s been stripped of all its moisture. The Orange Blossom Exfoliator is 92% organic and also vegan, cruelty-free and fairly traded. To get 15% off this Green People’s exfoliator, use the code HEALTHY15, FREE UK delivery. I’ve never been a fan of creamy cleansers but now that I’ve tried Green People Orange Blossom Cleanser I am really starting to like them or I should rather say I fell in love with this cleanser from Green People. I use Orange Blossom cleanser in the shower every day and I just love massaging it onto my wet skin. I massage it well in circular motion to make sure I remove all the dirt and makeup. The creamy cleanser feels nice on the skin and while cleansing I feel like I am having an aromatherapy as well. The scent is just gorgeous. It’s flowery but not that feminine. It’s quite strong but not overpowering. It’s just perfect. This type of cleanser doesn’t foam but it still cleanses the skin really well. After rinsing it off with warm water I am left with soft skin which hasn’t lost its moisture as the cleanser doesn’t dry it out. If you suffer from dry patches then this cleanser is definitely worth considering. Jojoba oil in the cleanser is the one that protects against moisture loss and keeps skin hydrated. The cleanser is also alcohol-free. In the Orange Blossom cleanser you will also find ingredients which are soothing and anti-inflammatory. The cleanser is 91% organic, vegan, cruelty-free and fairly traded. To get 15% off this Green People’s cleanser, use the discount code HEALTHY15, FREE UK delivery. 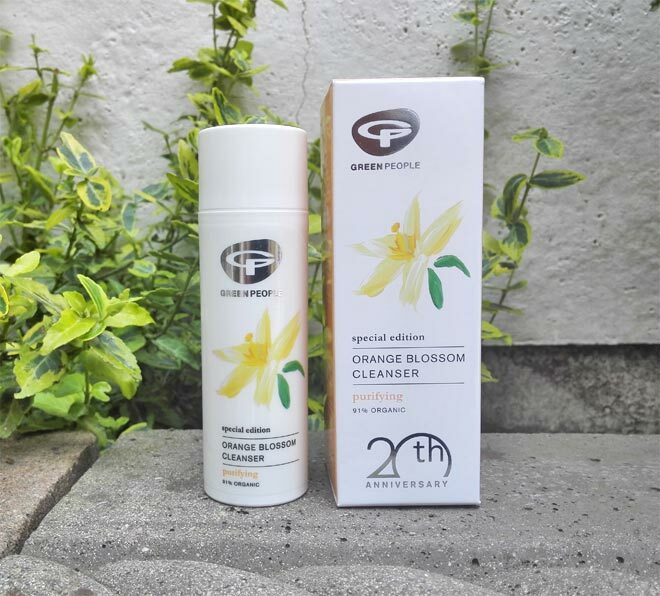 I am really impressed with the whole Orange Blossom range from Green People. All of the products are really lovely and smell gorgeous. They are not only great for women but also for men as the scent is not that feminine (in my opinion). It feels that Green People have spent lots of time thinking about the formulations and testing the scents to create these gorgeous products. Orange Blossom range is definitely worth a purchase and I cannot recommend it enough. If you do decide to buy any of these products, remember to use the voucher code HEALTHY15 to get 15% off. Disclaimer: In this post you will find some affiliate links – if you click on them and purchase a product I get a small commission which helps me maintain this website. This does not cost you anything. Expect only honest and unbiased reviews of the products I receive. The scent of these products is so wonderful, I just love it. Green People are definitely a brand worth trying. Orange blossom is everything, and a lovely review indeed. Greetings to you. It is a really lovely range indeed and I highly recommend it. It’s great, you won’t be disappointed! The scent sounds like it would be heavenly! I love it but I know it won’t be everybody’s cup of tea.